I hope everyone had a fabulous Mother’s Day! My husband and son spoiled me. My morning started off with a big surprise, my husband had set up an hour and a half massage for me! After my massage, we went to brunch at one of our favorite restaurants. 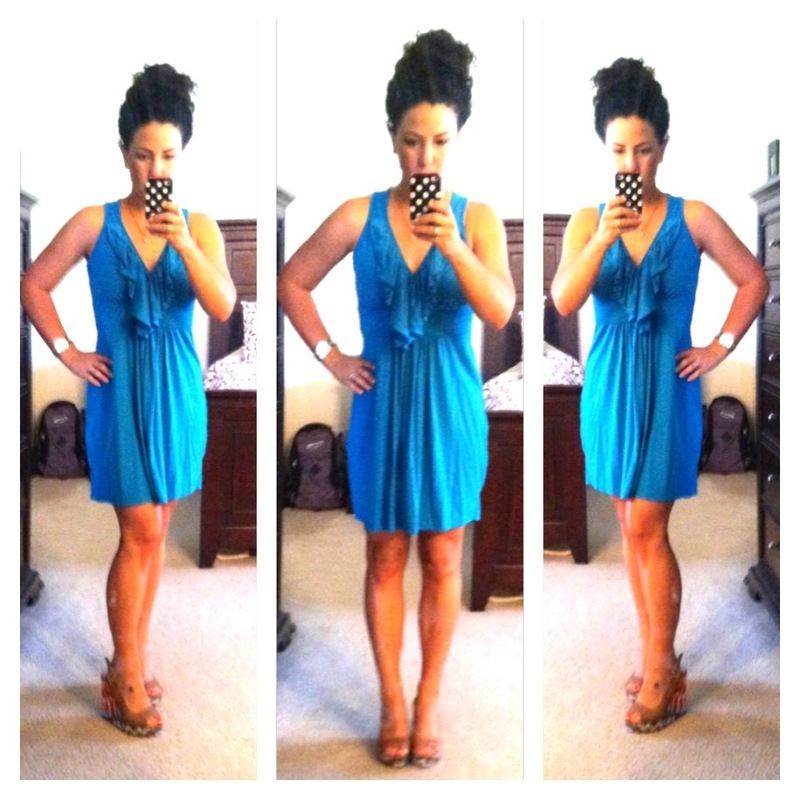 Turquoise ruffle dress $12 TJ Maxx bought last summer. I am drawn to teal, turquoise, green, and blue – a friend of my that is a bit of free spirit told me it is because I am a Pisces, which is a water sign. I don’t know if this is true, but I do know I love water-like colors! Whenever I need a dress for something, I can always find one at TJ Maxx. 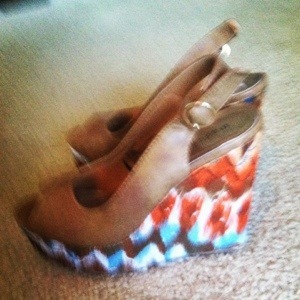 Steve Madden Watercolor Tan Peep-Toe Wedges $19.99 from Ross, last seen here. I need to wear these shoes more often, they are a bit high for me, but they are so stinkin cute! I used my new Coach Ashley Satchel tote my husband bought me, you can see it here. The photo I took in our kitchen doesn’t do the bag any justice, it is more like the tan or camel color of my shoes than the yellow color it appears in the photo. I also wore rose gold jewelry. I felt like a princess or queen on Mother’s Day, which is exactly how all moms should feel! I even got to take a nap! I am very fortunate to have such a wonderful family. very chic, and goes great with lifted hair-do! Thank you! I am embarrassed to say that my hair was this way because if I would have washed it, we would have missed our reservation!